Gather round, folks, these are exciting times - Intel has recently introduced cutting-edge desktop processors based on its fifth-generation Core architecture, codenamed Broadwell. Only, the excitement never really materialised, and the new chips are at risk of fading into obscurity with barely a whimper. First, a little refresher. Intel microarchitectures are typically delivered on a tick-tock cadence, with the tick primarily representing a die shrink and the tock being used to insinuate a major architecture revamp. Going back through recent generations, we had the 2011 fan-favourite Sandy Bridge (32nm, tock), followed by Ivy Bridge in 2012 (22nm, tick) and then Haswell in 2013 (22nm, tock). Whatever happened to a 2014 release? That's a good question. 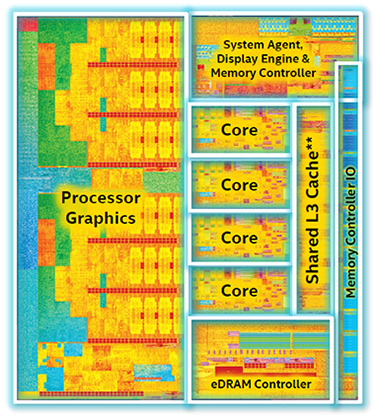 Broadwell, a 14nm die shrink and minor refresh of Haswell, is late to the party. Mobile chips based on the fifth-generation architecture did actually make their debut toward the end of last year, but desktop parts - the ones enthusiasts care about - weren't announced until June 2015, a full two years after the launch of the venerable Core i7-4770K. There are just the two socketed Broadwell chips being brought to retail in this first instance - the Core i7-5775C and Core i5-5675C - and, once you've perused the specification, you'll understand why there's little fanfare surrounding the new chips. Both carry a conservative 65W TDP and comparing the i7-5775C against the previous-generation i7-4790K reveals that peak frequency is down by 16 per cent, while CPU cache has been cut by 25 per cent. The focus, quite clearly, is on the integrated graphics, and perhaps rightly so. How many times have we heard users complain that high-end desktop processors are outfitted with second-rung HD graphics while Intel's top-of-the-range graphics processor - Iris Pro - is reserved exclusively for mobile parts? Not anymore. The i7-5775C and i5-5675C are Intel's first socketable LGA processors to be outfitted with Iris Pro graphics. Iris Pro 6200, to be precise, which features 48 execution units (a 140 per cent increase over HD 4600) and an accompanying 128MB of high-speed eDRAM. Acting as an additional pool of cache, the eDRAM - itself codenamed Crystal Well - is designed to service onboard graphics with greater memory bandwidth and, as a result, lessen the burden on system memory. It is the unique nature of the Crystal Well eDRAM that gives the Core i7-5775C its 'C' suffix, but enthusiasts will be pleased to learn that, while there's no visible 'K,' the chip is in fact multiplier unlocked. Making sense of Intel's nomenclature is easier said than done, but the top-end Broadwell could probably have been called the Core i7-5775CK, though the chip may then have been mistaken for an aftershave. Elsewhere, not a lot has changed, and that could be a blessing in disguise. Desktop Broadwell is served in the same LGA1150 form factor as Haswell, resulting in compatibility with existing Z97 motherboards albeit with the proviso that a BIOS update will be required. On the flip side, the use of an existing chipset means that PCIe lanes are limited to 16, there's no support for DDR4, and you'll be relying on motherboard vendors to issue a Broadwell-supporting BIOS. Such an update is available for our Asus Z97-A test platform, but there is a potential complication: if you buy a motherboard that isn't running the latest BIOS, you might not immediately be able to get up and running using a Broadwell chip. 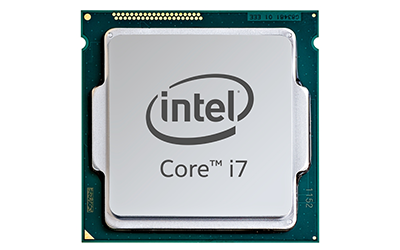 On paper, the i7-5775C is shaping up to be one of the least exciting Core i7 chips of all time and it's unusual to see a new Intel CPU launched with noticeably lower frequencies compared to the previous generation. Why might that be? Well, the cynics out there will argue that there's no 88W, 4.0GHz+ Broadwell part as such a chip would risk taking some of the shine away from upcoming Skylake. Can the enthusiast appetite be sated by an overclock? Our initial findings suggest not. Our engineering-sample review chip struggled to stay stable beyond 4.1GHz. We were able to briefly run at a maximum of 4.3GHz, but had to feed the chip with 1.375V in order to make it happen and the overclock wasn't reliable. If it's peak speeds you're after, you'll get a greater return from the existing, cheaper Core i7-4790K. This almost feels like a chip designed solely to showcase the progression of Intel's IGP, but perhaps the benchmarks will throw up a surprise or two? Let's find out.